Calculations at an oval. An oval is mathematically elusive, the word means egg-shaped. Usually, an oval is seen as a round, convex shape without vertex and with one symmetry axis. 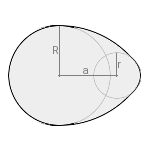 This special oval is formed by two circles with radiuses R and r and a distance a of their centers. 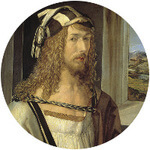 Around both circles, a third one is laid, which touches each of them in one point. The center of this is at the intersection of the two lines through touch points and centers of the other two circles. 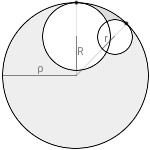 The area formed by this, a flat projection of a spherical triangle, is added to the two circles. This is repeated on the other side of both circles. Radiuses and distance have a one-dimensional unit (e.g. meter), the area has this unit squared (e.g. square meter).